The University at Buffalo Governance Project, initiated in 1994, was an interdisciplinary research effort to study governance issues in Erie County. The Governance Project was founded upon the premise that a vigorous region requires competent, informed decision making, especially in the public sector. 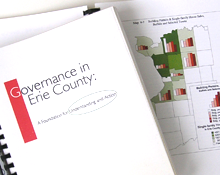 The effort culminated in 1996 with the release of the report, “Governance in Erie County: A Foundation for Understanding and Action.” The Governance Project was one of the programs upon which the Regional Institute was founded in 1997. This entry was posted on October 29, 2014 .